Mr Funtubbles is a family-friendly play area with establishments across the country. There are rides and attractions, with the décor and visuals reflecting the experience of a traditional funfair. 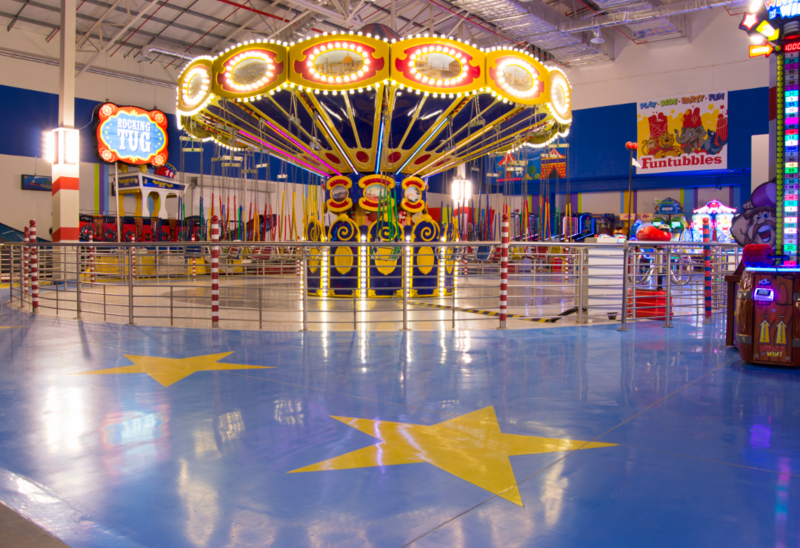 Flowcrete Africa has brought colour and creativity to a number of the children’s play areas at Mr Funtubbles with unique floor finishes that deliver bright, fun and exciting times for the whole family. Each Mr Funtubbles site’s visual identity revolves around a vibrant, clean, safe and colourful environment filled with rides and attractions. This image has been extended to the floor underfoot to reflect the company’s bright and happy image. Johannesburg’s The Glen Shopping Centre and Durban’s Gateway Theatre of Shopping installed a selection of decorative epoxy flooring solutions from Flowcrete Africa. At Gateway Theatre of Shopping, a completely new wing was added to the shopping centre so that the existing Mr Funtubbles could be upgraded and moved into a bigger space. Flooring was needed in the main ride and attractions area, a private party zone as well as the more understated coffee shop where the parents relax. A total of 1349m² of Flowshield SL and Peran SL Fruity was used to create a floor with the aesthetic and functional properties required by Mr Funtubbles. Of the hard-wearing, self-smoothing epoxy system Flowshield SL, 1185m² was applied in Sky Blue, Mid Grey, Light Grey and Slate Grey around the carousel. Blue and yellow areas with grey were used to create two-toned bands around the bottom of the carousel, while the floor of the adjacent coffee shop received a more sedate, laid-back look and feel. In the new Mr Funtubbles, 180m² Peran SL Fruity in Grapefruit with a glitter additive played a “starring” role, as the designers used this colour to create multiple large yellow stars embedded into the blue floor. Large numbers of children running around and playing may not seem like the most demanding of environments, but it can put a lot of stress and pressure into a floor. Another requirement was for the floor to maintain its visual impact despite the scuffs, scrapes and stains that lots of running, playing children would inflict on the floor. This is compounded by the potential for stains from spilled drinks and dropped food, scratches from arcade ride machines and wear from frequent cleaning. Flowcrete Africa’s resin flooring system is ideal for such scenarios, as these types of conditions won’t deteriorate the finish, and thanks to its seamless and impervious nature, it is very easy to clean. Johannesburg’s The Glen Shopping Centre also used 1036m² of the same flooring specification and a similar floor is in the pipeline for a Mr Funtubbles in the Cape Town area.